Here's a blog post from June 9. 2009. Things haven't changed much, or have they? The reference to clunkers had to to do with the cash for clunkers program. As for Potato Chips, they cost even more now. Palin gets her undies in a knot over being scoped out by one agent on face book. Normally the Secret Service is invisible, just like a waiter is, in a restaurant. He’s there but he isn’t. That agent posted her pic with him in it and in essence is saying “hey look at me, this is my job.” Everyone strives for a little recognition . I think that the Republicans have blown the whole thing out of perspective. Fox News has gone ballistic. It reminds me of Inspector Renault’s remarks in Bogart’s classic Casablanca movie when informed that gambling was going on in the casino “I’m just shocked" and then someone hands him his winnings. I can remember back to Bill Clinton and Monica. It ruined TV for months and did absolutely nothing to the Democratic Party. Obama is going to suffer some political damage over this, but if he handles it right, it could work out in his favor. There is no need to make the Secret Service the scape goat over this. The political damage has been done, Obama needs to stand up and take the hit, the buck stops with him. These are good men; they work hard, are well trained, and need some support if they mess up. Bawl them out for the balling they did and tell them to get back to work. Showing that you care about 12 people that are pretty close to you, tells a lot about a person’s character. Maybe that’s what leadership is all about. Ron Paul Are You Listening? This isn’t an endorsement; rather it’s an attack on both the Republicans and the Democrats. We have a President that has split the country with his health care program. Don’t assume that the ones disagreeing with him on health care are the ones that didn’t vote for him. Then we have a Republican Mitt Romney that makes 21 million a year who was governor of Massachusetts and seems to like universal health care. Why is he even bothering to run? This is the Republicans knight in shining armor? It’s kind of like his first Crusade, he’s not sure who he’s going to vanquish, but he’s polished up and ready to go. Get the dragon ready. The real thing to look at here is if Obama wins, we have a "TV personality," with a captive audience, who will lecture us for another 4 long years, on what we are doing wrong (yawn). If Romney wins, he’ll be blamed for the impending financial disaster. From there, the Democrats would stand to win the next election no matter what. I don’t see Mitt Romney being the right Republican choice for President. What voter wants to give his vote to the guy who already has everything? (“Vote for me and I’ll let you wash my Yacht”). In a depression, not too many folks are inclined to vote for a rich Republican. Normally, I vote Republican except when there is an incumbent. My grandfather gave me some advice, “Never change horses in mid-stream.” So if the Supreme Court, votes down the health care bill, I’d feel safe with Obama at the helm. It’s not like he is steering the boat, but we can let him take the blame for what Congress has done, and will do over the coming 4 years. There are two people out there, well known enough to run as independents, Ron Paul and Chris Christie, (governor of New Jersey). Ron Paul is a voice that talks common sense; he is addressing the national debt as a real issue and no one is really taking him seriously. Chris Christie is producing results that are working for his state. I don’t see either of them on the ballot. Maybe it is time for a third party. This is one time, where many voters might entertain voting for an Independent, it might not be viewed as “throwing your vote away.” Do we dare confront the Democrats and Republicans? I don’t care to vote for either one of them, they have blamed each other for all of our problems. Do we vote for the Used Car Salesman or the guy with the Yacht? Not much of a choice is it? The Call to Tax the Rich- Inflation At Its Best. I’ve written on this topic several times, but I guess I need to write it so I sound less Republican. The Democrats always want to tax the rich at a higher rate and it makes some sense, the rich need their status quo and their assets protected against theft from the poor. So part of the cost is justified in increased police protection (Now you know why the police will show up in Beverly Hills in 5 minutes whereas in Watts maybe the next day---after the sun comes up). But when we examine the playing field with a magnifying glass, things look a tad different. To the average person, a rich person is someone who doesn’t have to work for a living. The rich people Congress is pointing too, are wage earners, who work for a living. For the most part its dual income households or movie stars, sports players, book writers (we are not talking millions of people). When you delve into the realms of business, and professionals like doctors, these people can cut their own paychecks down to size. Then they pack the rest into their LLC or their retirement fund. Everyone tries to avoid paying taxes, it isn’t a rich thing, some people are just better at it than others. 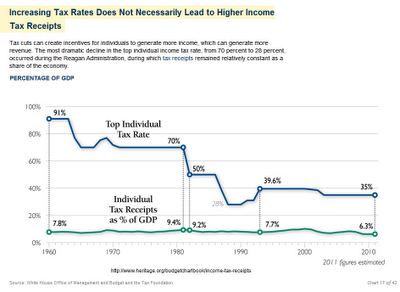 On a historical note, higher tax rates don't necessarily lead to increased revenue. See chart below. 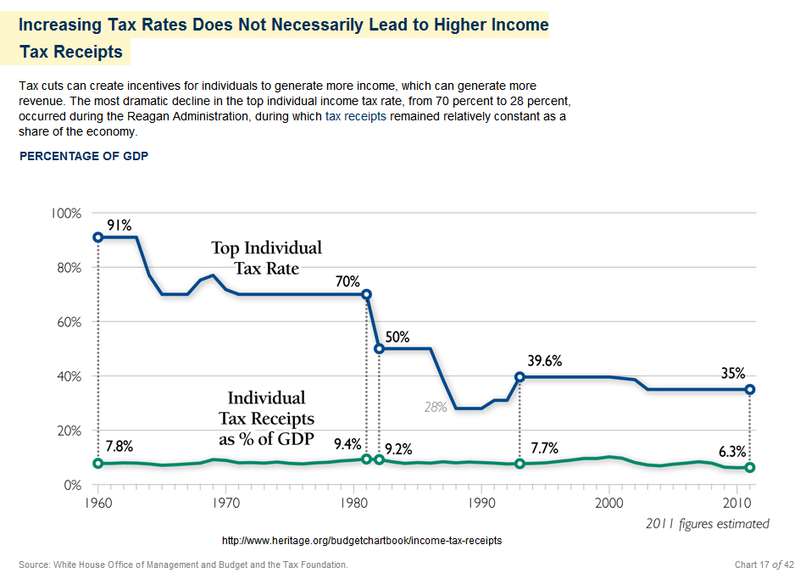 The fundamental difference between Democrats and Republicans, on taxing the rich, is that the Republicans know the futility of it and the Democrats exploit the “tax the rich” ploy to raise votes from those who are disenfranchised from wealth (too poor to afford a pot to piss in). The real bothersome thing about the call to "Tax the rich," is the enormous amount of money spent yearly servicing the interest on the national debt. That money could have been put to better use if we didn’t have the debt. So is taxing the rich an answer to our government’s tax revenue problems? Or is the interest on the national debt a problem that Congress thinks will go away? Why not spend down the debt? Of course, the truth is, Congress has never seriously contemplated paying off the debt, just make payments. The Republicans and the Democrats are fighting it out on the Hill. But in the meantime, the Federal Reserve is printing dollars to conveniently pay the bills when tax receipts fall short. Inflation is not meant to be a tax on the rich, but it taxes anyone with a long term savings plan. So with the funny money printing, who is the government taxing? Answer: anyone with money in the bank. What is the current rate of taxation (inflation)? Answer: 10 to 14 percent. How many years before you lose 90 percent of the buying power of your savings? Answer: 6 to 8 years (or less at current printing rates). Reality is a Case of Corona, a full tank of gas, a pack of smokes and a large pizza. Total cost $100. If your 85 years old, put it on your Master Card. Bernanke and Geithner have your card covered, just ask B of A. Tip: avoid the green bananas and buy the grandkids anything and everything they desire.